We had a wonderful Easter weekend. The boys went to Ma & Big Daddy's house for the weekend, so we only had Elizabeth for the weekend. The life of a one child parent is so simple, at least it seemed that way to us. After dropping the boys off, Beth and I took Elizabeth to The Cheesecake Factory. I had received a generous gift card for Christmas from a co-worker and we somehow managed to spend it all. I think I'm still on the sugar high. Saturday morning we took Elizabeth to an Easter Egg hunt in the s/d. She was so cute when she went up to the Easter Bunny and gave him a big hug. We then cleaned out our garage and can now actually park Beth's van in there. Hopefully someday we can get my car in there too. We're really not that far away, but we sure do have a lot of stuff. We took advantage of only having Elizabeth and went out to dinner again Saturday night at La Parilla, a great mexican restaurant up near Bentwater. They have a great performer there too. He sounds terrific and it's very entertaining for the kids. This could easily be the most kid-friendly restaurant in Atlanta; no wonder it's so crowded. Sunday we went to Athens to spend Easter with Beth's family. 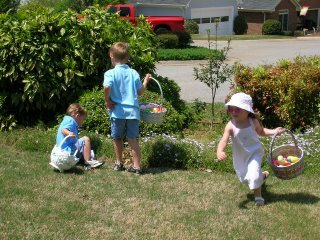 The kids did a huge egg hunt in Ma & Big Daddy's yard and we had a wonderful lunch at Memaw's. We were required to take all three kids home with us, so reality set back in pretty quickly. It was a great weekend. You can see all of the pics here.